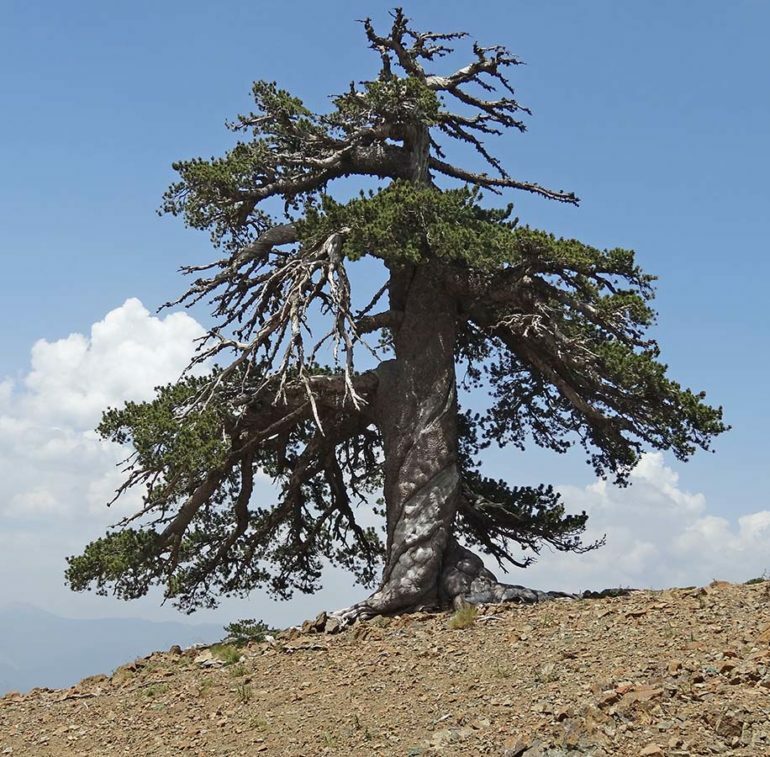 A Bosnian pine living in the highlands of Greece appears to be more than 1,075 years old, making it the oldest known living tree in Europe. Scientists determined the age by counting its annual rings. They’ve named it “Adonis,” after the Greek god of beauty and desire. University of Arizona researchers Valerie Trouet, Matthew Meko, and Soumaya Belmecheri were on expeditions in 2015 and 2016 to find and sample old trees to learn about the region’s environmental history. Scientists can reconstruct past climate by looking at width and density of the annual growth rings of trees. Adonis itself sports the twisted, spiral trunk and the thinning of leaves on top that characterize aged trees. Adonis and the other Bosnian pines at the site just look old, says Trouet, an associate professor of dendrochronology. Adonis itself sports the twisted, spiral trunk and the thinning of leaves on top that characterize aged trees. “To find an old tree like that in a country that’s been densely populated for so long—it’s amazing,” Trouet says. In 2016, the team came back to take more samples from the old trees, including Adonis. This time the group was armed with a coring instrument one meter long, says Meko, a doctoral student in geosciences. Adonis and its fellows are all individual trees with their own individual root system—each one is a unique individual, Trouet says. There are some plants and trees that grow as clonal organisms where the root systems may be older than Adonis, but the above-ground trunks are young. Other trees in Europe are known to be at least 700 years old, Trouet says. Because Europe has been densely populated for so long, most trees that sprouted more than 500 years ago have been long since cut down. Some of the oldest known living trees are the bristlecone pines of the Western US that live in desolate, windswept, arid, alpine habitats near treeline—habitats similar to where Adonis lives. Bristlecone pines are known to live more than 4,000 years. The researchers plan to learn about the past climate of Greece and the Balkans because those regions are strongly influenced by the jet stream, Trouet says. The team anticipates the climate records stored in old Balkan and Greek trees will provide new insights into Europe’s environmental history.